This is a staple in our house. It comes together in just a few minutes (one of the reasons many Asian dishes are my wheelhouse). I'm a firm believer in adapting the 5 taste sensations, and how it makes cooking healthfully easier and less time consuming. If you haven't heard of them, they are: sweet, salty, bitter, sour, and umami (savory). Each of your taste buds has 50-100 taste receptors, and when you have a bit of each sensation, it makes for a more unique and whole food experience! Asian foods use a lot of citrus, vinegars, bright and refreshing components in dishes. The key to a bomb fried rice is having your mise en place, or "everything in place", ready to go when you start. This dish comes together very quickly, so having everything ready is the best way to make sure nothing gets burned or overcooked! Mise en place is essential to stress free cooking! Using these tastes sensations as a guideline in my kitchen keeps things fresh and exciting, I hope you find it helpful! I love serving this with my Blistered Garlic Edamame, and Trader Joes Tofu Edamame Nuggets! Heat sesame oil in electric skillet, wok, or wide bottomed skillet on high. 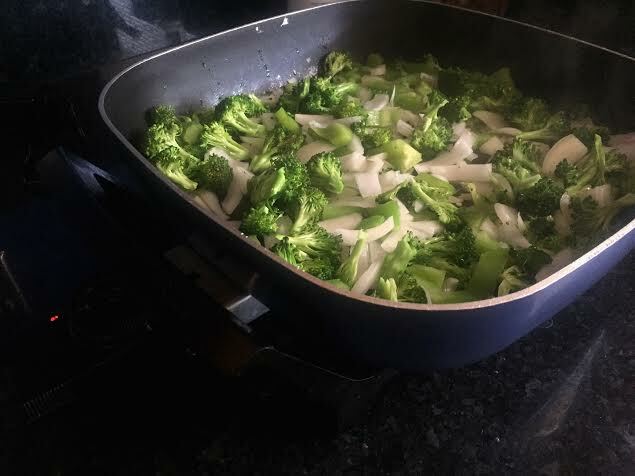 Toss in the veg when the oil ripples, and allow to cook for 3-4 minutes. I love some charred bits, stir often. Make a well in the veg when it's par-cooked, add a bit more sesame oil and add the rice. Let the rice fry for 1-2 mins, it starts to smell nutty and delicious. Pour the hoisin/soy mixture and incorporate the veg. Add sugar and fish sauce, cook an additional 1-2 minutes. In either an electric skillet set to the highest setting, woke, or wide bottomed skillet set to high heat, add a drizzle of sesame oil. While that's heating, combine the hoisin and soy sauce, this is the base sauce for the fried rice. Once the oil begins to ripple and is heated through, add all of the veg. Feel free to use a combination of your favorite veg, or what you have on hand, carrot, peas, bell pepper, etc. Let the veg cook half through, and push to the outsides of the skillet, add another small drizzle of sesame oil, and add the rice. Let sit for 1-2 mins if you like a crisped texture, otherwise, stir frequently, until the rice releases a nutty aroma. Add the hoisin and soy sauce mixture. Stir everything together. Add sugar and fish sauce, let cook for 1-2 minutes. Adjust to tastes. Serve with a wedge of lime, and garnish with cilantro. Dig in!